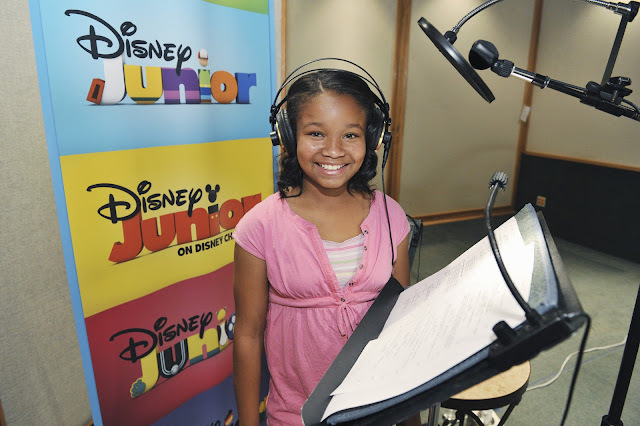 Kiara Muhammad voices the title character on the Disney Junior show Doc McStuffins. The 13-year-old, who has been acting since she was seven, plays the little girl who wants to grow up to be a doctor, so she's practicing stuffed animal medicine in her backyard clinic. Only she can see the animals come to life and describe their ailments like "Pricklethorns" and "No-vroom-vroom-a-tosis." We spoke with Kiara in an exclusive interview and found out how she got the role, what she has learned from playing Doc and what she's most passionate about. "I'm originally from the Boston area, Dorchester. At an early age my parents saw I was very theatrical. So we first moved to New York to do more theater and commercials and modeling but then I told them I wanted to do more TV so we moved to L.A."
"My agent submitted me for some voice over auditions. I was just getting started, it was literally one of my first voice over auditions. So I just auditioned and I got a call back and I was like, 'Okay, cool.' And then I then I booked it and I was like, 'Wow!' This is my first time doing voice over so I was kind of shocked but I was really proud of myself, too." "I was really into fashion and shoes and bags and stuff. Originally I think I wanted to be a fashion designer. But then as I got a little older I wanted to entertain people so I wanted to act." "We're not doing the album anymore, but I sing on the show. I want to be in choir but I can't because I have other obligations like Doc and auditions and stuff. So I like singing in the shower." "I'm most passionate about acting obviously. But I'm really passionate about how bullying is out of control right now. And how I really despise bullying because there's no reason for it. No one is less than another person." "Don't let them bring you down. If you just think about it, there's no reason for them to be doing it. So if you just think about that, there's no reason for you to be down. Because they're just using it as an excuse to make themselves feel better, when really they're lesser than you." "I have to say Michael Jackson. Because he's the King of Pop… and pop culture, too. I like to sing so I'd want to see how being a professional singer is rather than being a professional actress. So I could see the differences and similarities in that." Watch Doc McStuffins on weekday mornings at 10 a.m. EST/9 a.m. Central on Disney Junior.